Toronto and the GTA's top pic for photo booth rentals. Welcome to Toronto’s premier photo booth rental company. Photobooths have become common place at every wedding and corporate event, but finding the right suppliers to work with is key. We love making heros of our clients for bringing us to events where all the guest rave about how fun and unforgettable their Snapbox Photobooth experience was. We love spreading the photo booth joy everywhere we go, so give us a call and let us take care of the rest. 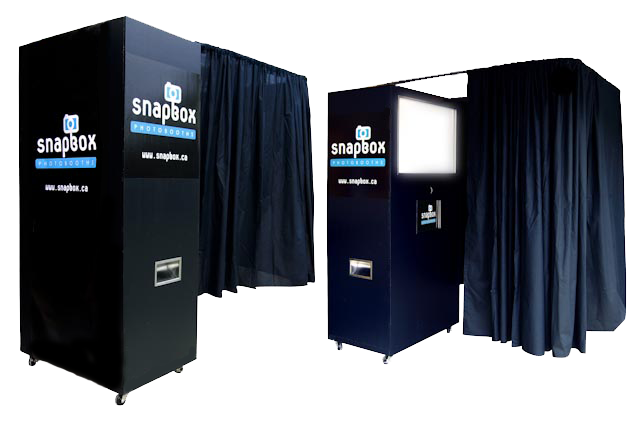 We’re very proud of our Snapbox Photobooth design. They can be configured in a classic closed curtain configuration or an open concept with a large backdrop for large groups. Outfitted with all the latest and greatest technolgy and gear, our photo print quality is second to none. Invite us to your next event and your guests will not stop talking all the fun they had.